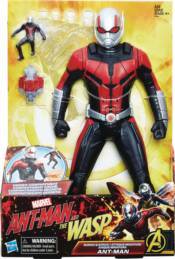 Imagine Scott Lang shrinking and launching through the air with this 12' scale Shrink & Strike Ant-Man Figure, featuring a hidden launcher that can send the included miniature Ant-Man figure or Quantum ship accessory flying! Load the included accessory into the port, then pull the arm to send it launching! Figure and accessories inspired by the upcoming Ant-Man and The Wasp movie.